Calling All Mercer County Residents! 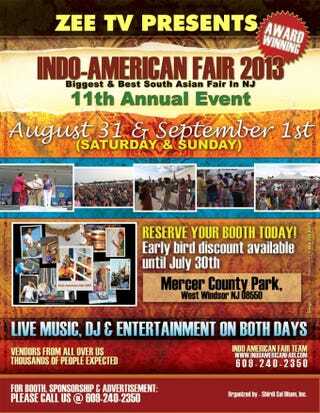 The 11th Annual Indo-American Fair is today until tomorrow! It's from 11 to 7PM at Mercer County Park, so if you can, check it out. I plan on going in the late afternoon since it looks like a good time.I swear I'm not affiliated with the event. I just wanted to share the news for people who might be interested! Check out the website for more information. Bollywood performer Poonam Dhillon will be making an appearance, so there's even a celebrity draw!